I have just spent the last two weeks training in Rio for the first time in the Laser. It was an awesome experience learning about the 2016 Olympic venue and training with other top Olympic Laser sailors from all over the world. Thanks for all of the continued support. The help from my suppliers and partners is very much appreciated, and the messages of encouragement and congratulations from all of you guys goes a long way! Andy Maloney won the medal race to grab bronze at the 2012 Delta Lloyd Regatta at Medemblik, in the Netherlands. Sam Meech also finished strongly to get 5th. Olivia and Jo won their medal race and the regatta in the 470 womens, and Paul Snow-Hansen and Daniel Willcox got silver in the mens 470. The regatta site www.deltalloydregatta.org has reports and results. Sail World has a good wrap of the NZ efforts. Another event here in Europe has just wrapped up. I finished the Delta Lloyd regatta with a bronze medal, after a week of sailing in a range of conditions, some fairly extreme! Be sure to click on the "Delta Lloyd Regatta 2013 - Bronze!.." post to read the full story. The final standings for out Laser Men at the ISAF Sailing World Cup in Hyeres. Andy Maloney and Sam Meech still at the sharp end of things in a regatta that saw the return of Robert Scheidt to Lasers, claiming a 2nd. I am now in Lake Garda, Italy! A week of fitness and getting mentally refreshed will be followed by a week of competing in the Garda Olympic Week. Another great fleet is registered for what is sure to be an intense competition. Laser Class Changing to Torch Class? You may be aware of the long running builders dispute between the designer Bruce Kirby and LaserPerformance (the builder and supplier of Lasers into UK, Europe and North America) over the non-payment of design royalties. In the latest phase of that dispute Bruce Kirby in conjunction with Performance Sailcraft Australia and two new builders in the US and Europe have announced they are converting operations to produce exactly the same boat under a new brand name the 'Torch'. A positive aspect is that Bruce Kirby and PSA's clearly stated motivation is to break a legal deadlock and reenable the worldwide production and supply of exactly the same boat as we are all sailing now - albeit under a different name. 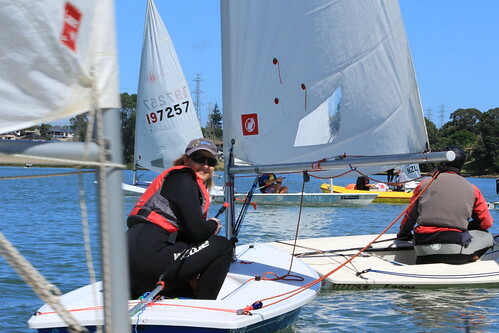 While the eventual outcome of the dispute still remains far from clear to us, particularly on an International and Olympic basis, what is clear is that locally we will all be able to continue to purchase equipment for and enjoy competing in the best one design fleet in NZ and the world. So while the Titans battle over the spoils lets just do our thing and keep doing what we have always done, enjoy sailing a great boat, and once the dust settles we will hopefully emerge with clear direction and a reinvigorated Class that will provide the platform for next 40 years. The 2013 seasons first big European regatta, the Princess Sofia Regatta in Mallorca was a brilliant start for the NZL Laser men. Andy Maloney's two bullets in the two medal races eased him past the leading Aussie, Tom Buton who OCS'd in the last race. Sam Meech was third and Thomas Saunders 15th in the 119 boat fleet. Andrew Murdoch and Josh Junior were 7th and 8th in the 72 strong Finn fleet. Andy's latest wrap up and links below. Racing here in Palma at the first European stop of the ISAF Sailing World Cup of 2013 has just wrapped up, and I am happy to come away with the win after having an awesome final day racing with two wins! I am looking forward to a week off the water and then getting back into it in the build up to the next event in Hyeres, France. Please Note: This information applies only to Laser Standard and Laser Radial sailors intending to take part in any upcoming ISAF Sailing World Cup event or the 2014 ISAF Sailing World Championships. Please circulate this notice to your sailors and coaches who may be attending these events.